A lasting relationship is when one loves talking and the other likes listening. The constant talking and listening keeps their get together alive and interesting. At the same time the conversation allows good communication and making sure the couple could understand each other better as a soul mate forever. Even at the later part of their old age when they have very few friends alive, their love of talking could still keep their companionship going. 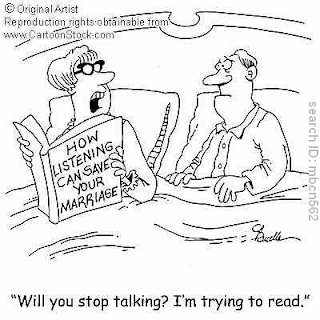 Reason because there is another partner who loves listening while the other likes talking. If you are one couple with neither one likes to talk, I believe your romance relationship might be uninteresting. And the danger is, when at old age both might be unhappy and have nothing to share. A sorrowful heart is a sad heart for both. On the other hand, if both the couple are good talkers and both are lousy listeners, might not end out well either. Talking too much without pausing and allowing the other person to understand could create anger and frustration. If this happen, I guess there would be a lot of argument and fighting within the couple. The best compatible couple is one who loves talking and the other one adores to listen. One good example is Robert Foo and his little darling. He talks with passion from earth to the moon, he could talk from night till the morning and yet she is happy to listen his ever exciting stories and wisdom. Now when she isn't around, he might as well talk to all his readers through blogging here. Food for thought - "To listen well, is as powerful a means of influence as to talk well, and is as essential to all true conversation" - Chinese Proverbs quotes.